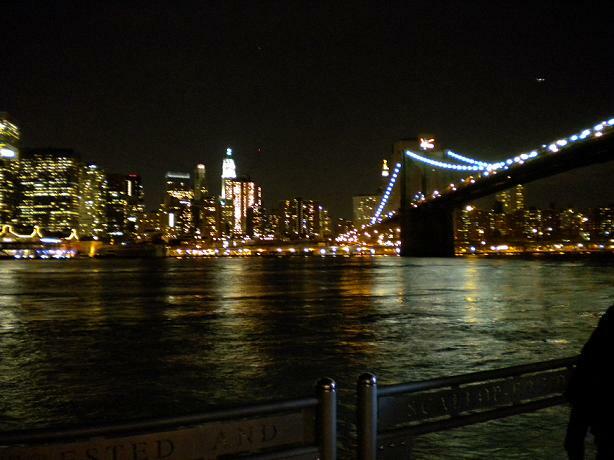 Manhattan, as seen from Brooklyn. What with one thing and another I’ve been too busy this week to say anything about my first-ever visit to NYC. And I don’t have much time now. But let me say this: It was awesome. The above photo was taken on our first night after dinner at Grimaldi’s Pizzeria in Brooklyn, right under the bridge. An hour wait to get in. Neat neighborhood pizzeria, comparable to Casa Bianca in Eagle Rock in style and ambience, although the pizza was overrated — solid, but not the classic NY-style pizza one might have expected. Good experience, though, and a block away, I took this shot. More later this week, and probably next week, and in an upcoming column. Great photo, but when I look at it I keep thinking of the opening credits for Moonlighting. Your take on the Grimaldi pizza makes me feel much better that I’ve never gotten around to trying their outpost here in the Phoenix metro.